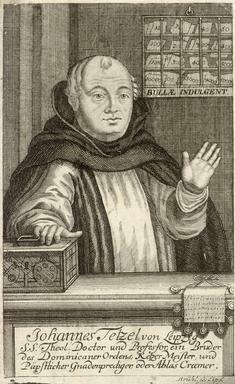 Preacher and salesman of papal indulgences, the son of Hans Tetzel, a goldsmith of Leipzig, was born there about 1460. He matriculated at the university in 1482, graduated B.A. in 1487, and in 1489 entered the Dominican convent at Leipzig. He early discovered his vocation as a preacher of indulgences; he combined the elocutionary gifts of a revivalist orator with the shrewdness of an auctioneer. He painted in lurid colors the terrors of purgatory, while he dwelt on the cheapness of the indulgence which would purchase remission and his prices were lowered as each sale approached its end. He began in 1502 in the service of the Cardinal-legate Raymond Peraudi; and in the next few years he visited Freiberg (where he extracted 2000 gulden in two days), Dresden, Pirna, Leipzig, Zwickau and Görlitz. Later on he was at Nuremherg, Ulm and Innsbruck, where he is said to have been condemned to imprisonment for adultery, but released at the intercession of the elector of Saxony. This charge is denied by his apologists; and though his methods were attacked by good Catholics like Johann Hass, he was elected prior of the Dominicans in Glogau in 1505. Fresh scope was given to his activity in 1517 by archbishop Albrecht of Mainz. Albrecht had been elected at the age of twenty-four to a see already impoverished by frequent successions and payments of annates to Rome. He had agreed with Pope Leo X to pay his first-fruits in cash, on condition that he were allowed to recoup himself by the sale of indulgences. Half the proceeds in his province were to go to him, half to Leo X for building the basilica of St. Peter's at Rome. Tetzel was selected as the most efficient salesman; he was appointed general sub-commissioner for indulgences, and was accompanied by a clerk of the Fuggers from whom Albrecht had borrowed the money to pay his first-fruits. Tetzel's efforts irretrievably damaged the complicated and abstruse Catholic doctrine on the subject of indulgences; as soon as the coin clinks in the chest, he cried, the soul is freed from purgatory. in June he was at Magdeburg, Halle and Naumburg; the elector of Saxony excluded him from his dominions, but Albrecht's brother, the elector Joachim of Brandenburg, encouraged him at Berlin in the hope of sharing the spoils, and by the connivance of Duke George of Saxony he was permitted to pursue his operations within a few miles of the electoral territory at Wittenberg. Martin Luther was thus roused to publish his momentous ninety-five theses on the subject of indulgences on October 31, 1517. Even Albrecht was shamed by Luther's attack, but he could not afford to relinquish his profits already pledged for the repayment of his debts; and Tetzel was encouraged to defend himself and indulgences. Through the influence of Conrad Wimpina, rector of Frankfurt, Tetzel was created D.D. of that university, and with Wimpina's assistance he drew up, in January 1518, a hundred and six theses in answer to Luther's. But the storm overwhelmed him: sober Catholics felt that his vulgar extravagances had prejudiced Catholic doctrine, and Miltitz, who was sent from Rome to deal with the situation, administered to him a severe castigation. He hid himself in the Dominican convent at Leipzig in fear of popular violence, and died there on the 4th of July 1519, just as Luther was beginning his famous disputation with Johann Eck.